Rhabdomyosarcoma is a type of cancer that begins in a type of muscle called striated muscle. Striated muscles are the skeletal voluntary muscles, which are those muscles that people can control. Rhabdomyosarcoma can occur anywhere in the body. Rhabdomyosarcoma starts from mesenchymal cells, which are immature cells that normally develop to form muscle. Rhabdomyosarcoma tumors are classified into favorable and unfavorable histology subsets, depending on what the cells look like under a microscope. Keep in mind that "favorable" and "unfavorable" tumors refer to the cancer cells, and not the child. Doctors and researchers don't know what causes most childhood cancers. In most cases of rhabdomyosarcoma, there are no clear risk factors. A few cases of rhabdomyosarcoma have been associated with some congenital (present at birth) anomalies (abnormalities). Parental use of cocaine and marijuana prior to a child's birth may increase a child's risk of developing rhabdomyosarcoma. Children with rhabdomyosarcoma may experience the following symptoms. Sometimes, children with rhabdomyosarcoma do not show any of these symptoms. Or, these symptoms may be similar to symptoms of other medical conditions. If you are concerned about a symptom on this list, please talk with your child's doctor. Because rhabdomyosarcoma occurs most often in areas that cause noticeable symptoms, it is often diagnosed early. Small, visible, painless lumps often form near the surface of the body, where they are easily spotted. The symptoms of less obvious tumors can vary depending on the part of the body affected. Biopsy. A biopsy removes a small amount of tissue for examination under a microscope. The type of biopsy performed will depend on the location of the cancer. 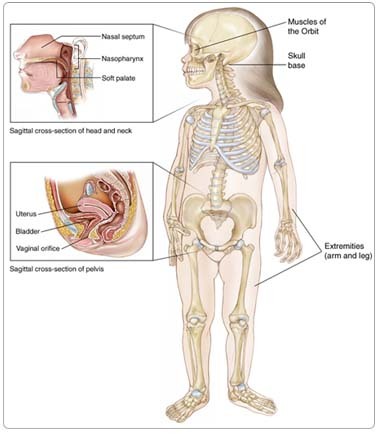 If the tumor is near the surface, the child will be given a local anesthetic during the procedure; if it is deeper inside the body, a general anesthetic will be used. Immunocytochemistry tests. These are special stains done on the cells taken during the biopsy to help the doctor make an accurate diagnosis of rhabdomyosarcoma. Special stains that show muscle differentiation, including MyoD-1 and Myogenin, are most helpful. Genetic tests of tumor tissue. Changes in certain chromosomes (structures that contain the genes in a cell) in the tumor cells, called chromosomal translocations, can help doctors identify the alveolar subtype of rhabdomyosarcoma, although some alveolar rhabdomyosarcomas lack any specific translocation. X-ray. An x-ray is a picture of the inside of the body. These pictures can help detect tumor growths in the bones or lungs and distortions of soft tissue caused by large tumors. Computed tomography (CT or CAT) scan. A CT scan creates a three-dimensional picture of the inside of the child's body with an x-ray machine. A computer then combines these images into a detailed, cross-sectional view that shows any abnormalities or tumors. Sometimes, a contrast medium (a special dye) is injected into the patient's vein to provide better detail. Magnetic resonance imaging (MRI). An MRI uses electromagnetic waves, not x-rays, to produce detailed images of the body. MRIs may create more detailed images than CT scans. Bone scan. A bone scan can detect whether cancer has spread to the bones. In this procedure, the doctor injects a small amount of radioactive material into the child's vein. The substance collects in the bone and can be detected by a special camera. Normal bone appears gray to the camera, and areas of injury, such as those caused by cancerous cells, appear dark. Positron emission tomography (PET) scan. In a PET scan, radioactive sugar molecules are injected into the body. Cancer cells absorb sugar more quickly than normal cells, so they light up on the PET scan. PET scans are often used to complement information gathered from CT scan, MRI, and physical examination. A PET scan may also be helpful to define the extent of a tumor and may be used to help determine which treatments will work best. The Childrens Oncology Group (COG) conducts national clinical trials that are available for children with rhabdomyosarcoma. COG is a National Cancer Institute-supported clinical trials cooperative group devoted exclusively to childhood and adolescent cancer research. To take advantage of these newer treatments, all children with cancer should be treated at a specialized cancer center. Doctors at these centers have extensive experience in treating children with cancer and have access to the latest research. Many times, a team of doctors treats a child with cancer. Pediatric cancer centers often have extra support services for children and their families, such as nutritionists, social workers, and counselors. Special activities for kids with cancer may also be available. Children and adolescents with rhabdomyosarcoma require multidisciplinary therapy planning, which means using combinations of chemotherapy, surgery, and, in many situations, radiation therapy. All children with rhabdomyosarcoma require chemotherapy, as well as therapy directed at local control of the tumor (surgery and/or radiation therapy). The goal of surgery is to remove the entire tumor and the margin (healthy tissue around the tumor), leaving a negative margin (no trace of cancer in the healthy tissue). Even children who have tumors that can be completely removed will require chemotherapy. If the tumor cannot be completely removed or is inoperable, the cancer will be treated with chemotherapy and radiation therapy to kill the cancer cells. If a tumor is inoperable, a biopsy is still needed to determine the type of tumor. Chemotherapy is the use of drugs to kill cancer cells. Chemotherapy travels through the bloodstream to cancer cells throughout the body. Chemotherapy for rhabdomyosarcoma is given by injection into a vein. The drugs that are used most often in North America for rhabdomyosarcoma are vincristine (Oncovin), dactinomycin-D (Actinomycin-D, Cosmegen), and cyclophosphamide (Cytoxan). This combination is called VAC. The new COG low-risk study (started August 2004) evaluates four cycles of VAC followed by vincristine and dactinomycin-D (called VA), attempting to further decrease the total amount of medication given. In addition, for those patients with some tumor remaining after surgery, this study continues the evaluation of a lower dose of radiation therapy. A recently completed COG intermediate-risk clinical trial tested whether the combination of topotecan (Hycamtin) and cyclophosphamide, added to VAC, improved the treatment's effectiveness. The study results are presently being analyzed. A new COG intermediate-risk trial will be activated by the beginning of 2007, testing whether the combination of irinotecan (Camptosar) and vincristine, added to VAC, will improve the treatment's effectiveness. In this study, a lower dose of cyclophosphamide will be used in VAC cycles, compared to the previous COG intermediate risk study described above. This study will also evaluate the use of early radiation therapy. A COG high-risk study was activated in 2006, further evaluating the activity of irinotecan and vincristine as initial therapy, followed by dose compressed therapy with alternating cycles of doxorubicin (Adriamycin) and cyclophosphamide, and ifosfamide (Ifex) and etoposide (VePesid), delivered every two weeks. To learn more about current COG research studies for rhabdomyosarcoma, visit the COG website. The most common side effects of VAC therapy are nausea, vomiting, and bone marrow suppression. Although very rare, a few patients may have significant liver damage. Doxorubicin also causes nausea, vomiting, bone marrow suppression, and may cause sores in the mouth. Rarely, this drug affects heart function. Irinotecan may cause loose bowel movements. Common side effects for ifosfamide and etoposide include nausea, vomiting, bone marrow suppression, kidney and central nervous system changes. Intensive therapy used for intermediate- and high-risk rhabdomyosarcoma may cause infertility (the inability to have children). The medications used to treat cancer are constantly being evaluated. Talking with your doctor is often the best way to learn about the medications you've been prescribed, their purpose, and their potential side effects or interactions with other medications. Learn more about your prescriptions through PLWC's Drug Information Resources, which provides links to searchable drug databases. Radiation therapy is the use of high-energy x-rays or other particles to kill cancer cells. The most common type of radiation treatment is called external-beam radiation therapy, which is radiation therapy given from a machine outside the body. When radiation treatment is given using implants, it is called internal radiation therapy. Treatment for recurrent rhabdomyosarcoma (cancer that has come back after treatment) may involve chemotherapy, but it depends on how much of the tumor can be surgically removed, where the cancer recurred, and the treatment the child received previously. Often, new experimental therapies are offered at specialized centers for recurrent rhabdomyosarcoma. Cancer and cancer treatment can cause a variety of side effects; some are easily controlled and others require specialized care. Below are some of the side effects that are more common to rhabdomyosarcoma and its treatments. After completing therapy, children treated for rhabdomyosarcoma should be monitored for tumor recurrence. Most recurrences develop within the first three years from diagnosis; during this time, routine monitoring should include regular physical examinations and imaging studies (at least every two to six months for the first two years after completing therapy). Most children treated for rhabdomyosarcoma have received relatively large doses of cyclophosphamide, or similar alkylating agents, and are at risk for damage to the testis (for boys) or ovaries (for girls), causing infertility and other problems. Sites that have received radiation therapy are at risk for growth abnormalities. Bladder dysfunction may occur in children who had bladder or prostate tumors. Children with parameningeal tumors usually receive radiation therapy that can affect the pituitary gland; these children may develop growth hormone deficiency. Children should be routinely monitored for growth patterns, development of sexual maturity, and bladder function. If the eye or mouth was in the radiation field, regular eye examinations and dental examinations are important. Children with extremity (arms or legs) primary tumors may have decreased growth in the affected limb and later limb-length discrepancies. This should be monitored and, if this develops, an evaluation by an orthopedist (bone doctor) is recommended. Children who have successfully completed therapy for rhabdomyosarcoma may develop second cancers, although this risk is very low. Second cancers may include: bone sarcoma, brain tumor, and acute myeloid leukemia (AML).